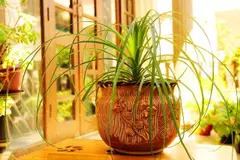 Nolina or Ponytail palm's best quality is how easy it is to grow: As long as you don't overwater it, the plant may seem virtually indestructible. It's a slow grower that's perfect for just about any room of the home, especially bedrooms. 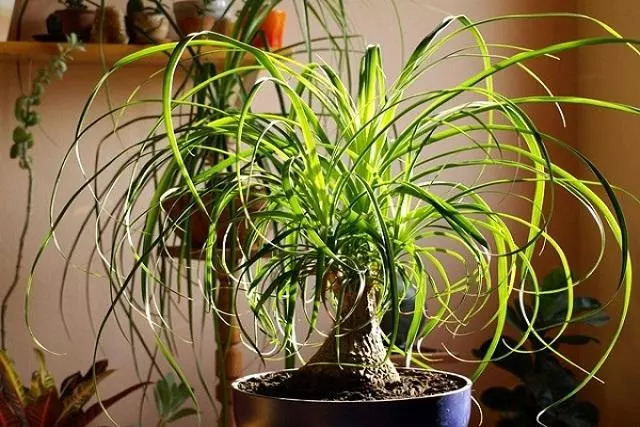 A small ponytail palm looks fabulous on tabletops. 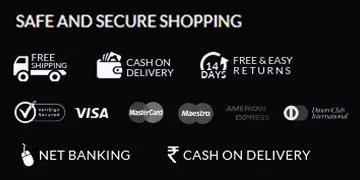 It has a spare appearance that makes it fantastic for contemporary and modern interior designs, as well as casual settings. Basically, you can grow this houseplant anywhere. Over time, this slow-growing tree can put on some size and grow a couple of feet tall indoors. Because this houseplant is so slow growing, though, don't expect it to happen any time soon! Small specimens of ponytail palm are a wonderful choice for side tables, end tables, or coffee tables. Care Instructions Grow Nolina palm in bright light for best growth, but it tolerates medium- and low-light spots, as well. Because it stores water in its thick trunk, ponytail palm can survive extended periods with no water -- making it the perfect houseplant if you tend to travel a lot or are a forgetful waterer. That said, this houseplant tree will grow best if watered regularly -- when the top inch or so of the potting mix starts to dry. 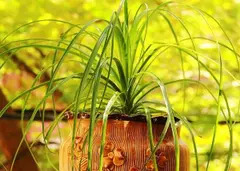 Fertilize ponytail palm a couple of times a year in spring and summer. You can use any fertilizer labeled for use on houseplants; just be sure to follow the directions on the product packaging. If you wish to fertilize your plant more frequently, you can -- it will respond by growing faster. If leaf tips turn brown, simply clip off the brown parts with a sharp scissors to keep the plant from looking unsightly. Nolina palm is not intended for human or animal consumption.